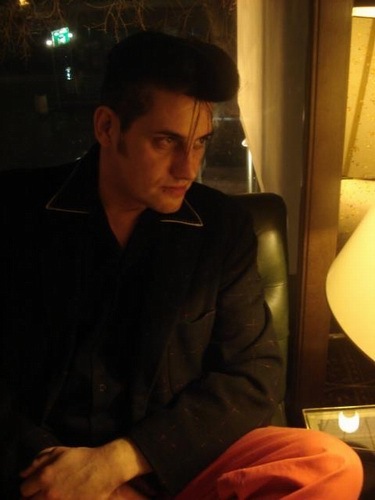 Patrick Ouchene is 43 year-old Elvis Presley lookalike from Brussels. However, Patrick does not copy the great classics of the time, he writes and composes his own songs. 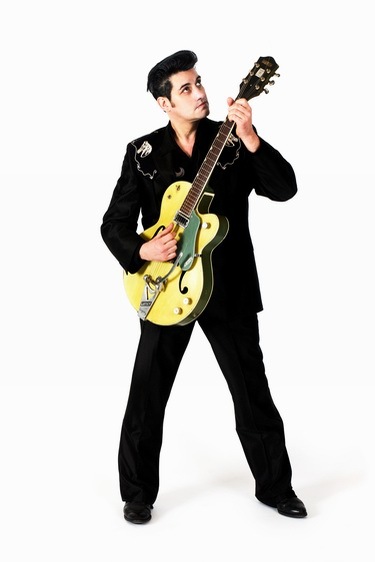 Currently he is member of rockabilly band Runnin' Wild, where he sings and plays guitar. His greatest success was "Je Suis Swing" with the band The Domino's, a song that has entered in 1991 French top 10. With this song, the Domino's had participated in the major French shows of Michel Drucker, Jean-Pierre Foucault, Pascal Sevran ... and even had the great honor of singing "C'est a Paris" a duet with Charles Aznavour. 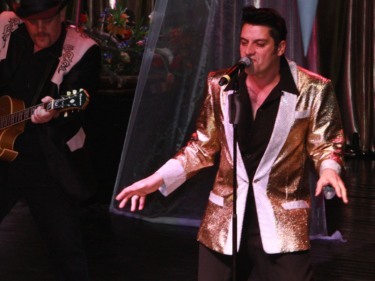 He was also member of The Million Dollar Sunrise - an act reporoducing Sun-Sound of 1955 and featuring Runnin’ Wild’s Koen as Johnny Cash, Mario as Carl Perkins and Patrick Ouchene as Elvis plus Marcel Riesco (Truly Lover Trio) as Roy Orbison. 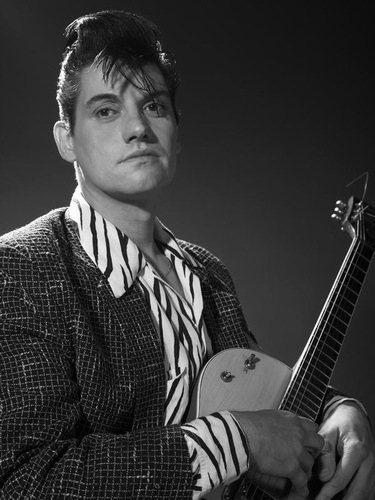 More recently, Patrick Ouchene has produced six full CD's that offer Rockabilly explosive cocktail straight out of the fifties and flowing well in the world of aficionados of Rock'n Roll. He is also Manager/Organisator of several summer festivals in Belgium, with multiple artists and bands from all around the world, since 2003 with the A.S.B.L "ASK4", also producing a workshop to initiate kids and teenagers to the Rock'n'Roll world and the History of Music. The song lyiricist is Jacques Duvall (aka Eric Verwilghen) (worked with Lio, Alain Chamfort, Etienne Daho, Jane Birkin, Marc Lavoine and on the latest release of Runnin' Wild "I Dressed In Black Today"). Fascinated like everyone else by the phenomenon of celebrity lookalikes, people who live inside their idols’ skin, Jacques Duvall has invented this ultimate, surrealist double, “who does not know that he is not the first to be what he is”. The theme of the song "Copycat" is a game on this double identity (Elvis and Ouchene). 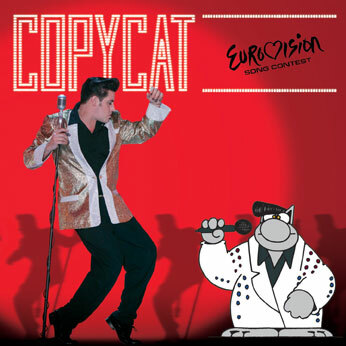 "Copycat" is the complaint of a rock'n'roll singer who believed he had invented a style and discover with surprise that someone else is like him, copying him. There must be thousands of Elvis Presley impersonators around the world. Elvis tribute contests are organised in every corner of the planet. But, lo and behold, one of these clones has never heard of the original. He dresses, sings and lives like the King without ever having been aware of his existence or having intended to imitate him. He even goes as far as accusing Elvis of copying him… There are several meanings in this text, which ask a number of philosophical questions: How do we find our place here on earth? How do we become free of these imitations in order to be ourselves, to become the original? This can also be seen from this melody that searches for an identity and develops like a musical adventure following the course of history. You can watch the video for Copycat on RTBF Eurovision pages and listen to the extracts of the song versions on myspace. Patrick's website: patrickouchene.be Патрик Оушен - 43-х летний подражатель Элвиса Пресли из Брюсселя. Однако он не перепевает классику, он пишет и сочиняет собственные песни. Сейчас, он - участник рокабилли группы Runnin' Wild, где он поет и играет на гитаре. Его крупнейшим успехом был выпуск песни "Je Suis Swing" в составе группы The Domino's, которая в 1991 году вошла во французский топ 10. С этой песней The Domino's приняли участие во многих французских телешоу- Мишеля Дрюкера, Жана Пьера Фуко, Паскаля Севрана и даже исполнили дуэтом песню "C'est a Paris" с Шарлем Азнавуром. Он также был участником The Million Dollar Sunrise - группа в которую вошли участники Runnin’ Wild’s Коен в роли Джонни Кэша, Марио в роли Карла Перкинса, Патрик Оушен в роли Элвиса и Марсель Риеско (Truly Lover Trio) в роли Роя Орбисона. За недавнее время Патрик Оушен выпустил 6 альбомов, которые предлагают слушателям взрывоопасный коктейль рок-н-ролла из 50х годов и которые с воодушевлением были встречены поклонниками стиля. Он также является организатором ряда летних фестивалей в Бельгии, в которых выступают артисты со всего мира. Также он основал классы, где знакомит детей и подростков с миром Рок-н-ролла и обучает их Истории музыки. Композитор песни - Miam Monster Miam (Бенджамин Шоос) - певец, композитор, продюсер, иллюстратор и юморист. "Эта песня представляет собой весьма креативную и интересную смесь. Нельзя сказать, что это в чистом видео рок-н-ролл 50х или рокабилли, мелодия в основном в стиле поп, а потом ускоряется даже до военного марша. Ее современное звучание облегачает метафизический текст Жака Дювалля, как пузырьки шампанское". Автором текста песни является Жак Дювалль (также известный как Эрик Вервилген) (работал с Lio, Alain Chamfort, Etienne Daho, Jane Birkin, Marc Lavoine и над последним альбомом Runnin' Wild "I Dressed In Black Today"). Пораженный феноменом "звездных двойников", людей, которые проживают свои жизни под личиной своих идолов, Жак изобрел сюрреалистическую тему для песни. В песне "Copycat" обыгрывается двойная личность исполнителя (Элвис и Оушен). "Copycat" - это жалоба исполнителя рок-н-ролла, на то, что он изобрл стиль и неожиданно обнаружил, что есть еще кто-то похожий на него, копирующий его. В мире могут быть тысячи имитаторов Элвиса Пресли... по всей планете проводится множество соревнований двойников Короля. Но один из этих клонов никогда не слышал оригинала. Он одевается, поет и живет как Элвис, даже не зная о существовании оригинала, которому он никогда не пытался подражать. А узнав - обвиняет его в плагиате... В песне задаются несколько философских вопросов - как найти свое место в мире? Как остаться самим собой, стать оригиналом, а не копией? Евровидение, по словам Жака Дюваля: "Это как цирк, мне так нравится это чувство, что прямо мурашки по коже. И в этом году мы выступим в роли клоунов. Я надеюсь, что наша песня принесет три минуты счастья детям всех возрастов, которые будут смотреть шоу". CD сингл на песню включает в себя: оригинальную версию, remix, demix и караоке версию. Также приобрести его можно в iTunes. Видео на песню Copycat вы можете увидеть на сайте RTBF и прослушать отрывки версий песни на myspace. Way down in the U.S. of A. He makes me want to hire a killer! - Hello, Patrick, and first of all our congratulations for being selected Belgian representative at Eurovision 2009! How do you feel now, being a Eurovision participant? - Well, exited about, also very busy, as I did knew how much work it means to be at this contest. - There is a certain concept in a Belgian act this year, can you tell it how it has been created, who is a main force behind it, and how you were approached to join the team? - It started via the composer “Miam Monster Miam“ who had a idea of doing something rock'n'roll, then he called Jacques Duvall (famous writer, who works a lot with a French, Belgian, and other singers), then they finally contacted me, told me the concept, then we've been doing a demo with a label ”team4 action“ for the selection, and you know the rest. The concept is a surrealistic Belgian image bringing a cartoon, two female backing with amazing dress and wigs, all with a rockabilly image - with double bass, big guitar and rock'n'roll singer. - How can you describe your song “Copycat”? - A good song very catchy somewhere in between pop and rock on where I add the rockabilly vocal, and some surf guitar solo. The lyrics are great too about a man who never heard that someone in the States where doing the same as he, wearing the same clothes etc.. typical belgium surrealistic way. 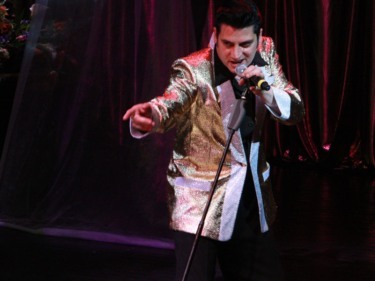 - The concept of costumes of yourself and band is following real stage costumes of Elvis and his band. Have you been specially studying this issue, or contacting Elvis experts? - First of all im a rockabilly singer, and my day time clothes are always done in the 50’s way, I know by heart all the looks the clothes that Elvis was wearing in the 50's. Actually I play quiet often in Moscow with my band “Runnin’ wild“, for example the 2nd of May I'll be there in Moscow for a big rockabilly event, to enjoy with the Russian rockabilly cats some marvelous moment. - Some Elvis fans have reacted negatively to the lyrics of the song you’ll be performing. What can you respond to them? - Well, it's just a song, nobody wanted to insult Elvis and surely not me, as I m a big Elvis fan in the 50’s, I think they didn't really understand the double meaning of the words and we never use the name Elvis in the song. - I don't know, as I'm really new to this contest, we've been approached by several countries to go to their fan parties, but it is up to RTBF to decide to go or not depending of the cost and the priority. But I think it could help the project in order to let some country heard your song before the contest. - You have done great video for your song, can you tell us more how it was created? - We had a exact idea of the concept of the video clip, and the move on stage are my natural stage act, the suit, the girls did the rest, at the end we add the cartoon for the very popular Cat in action with me. - Any hints on how the stage presentation will look like? Will it be similar to the video? Is there a chance that The Cat will join you on stage? - Yes it will be very similar, and yes the cat will join me on stage or on the screen, all together it makes of this presentation a great familial product, for kids, for music lovers and also to bring people who never look at the contest in the screen to vote for a rock'n'roll act, singing by a real rockers. - Not the last few years, but I got great memories of some oldies there: Brotherhood of Man, Buck Fizz, Papa Penguin etc.. and some that I discovered like Volare, that I didn't even knew it was on the Eurovision. - Winning of course! !, even if we get the the final it will be a good result for Belgium. - A bit of the 3 I think, but the song has to be good and catchy to have a life before and after. - It seems yes it's quiet political, but not more than football etc.., I regret it, music has to be the center of a such contest, I hope this year the public will put on the side this aspect and vote for fun, not for the politic correctness. - This year juries are re-introduced to the contest, is it a welcomed change for you? - Yes, I think so it's good to have a professional jury on top of the vote, to save song for small land etc. - Will you be following information on selections in other countries, will you listen to the participating songs in advance? - Waouw I got a long carrier, I sung with people like Aznavour, Nougaro, for the French side, American singer too, there's too many highlights to mention one, just this contest this year will be one of them for sure. - Not really, I use a musical style very unique and roots, from the swing to the early rock'n'roll and I will do the same in Moscow, be myself that's all if the people like it good if not I will not dying for that too. - You are now a member of the band Runnin’ Wild. How band members reacted on your participation in Eurovision and the fact you’ll have different group to perform with in Moscow? - I use my bass player on stage in Moscow, and my drummer will be there during the 2 weeks to play live showcases etc, the band react good as we got the media turned on us and on our lifestyle. - Is Copycat a one-time project, or there may be some more cooperation with this team after Eurovision, such an Elvis tribute album? - It will depend on the success of the song in Moscow yes, in case we will do a complete album of the project. - You already had an experience of portraying Elvis in The Million Dollar Sunrise project, can you tell us more about this? - It s a project that we created many years ago while I was doing some musicology work shop in the school. 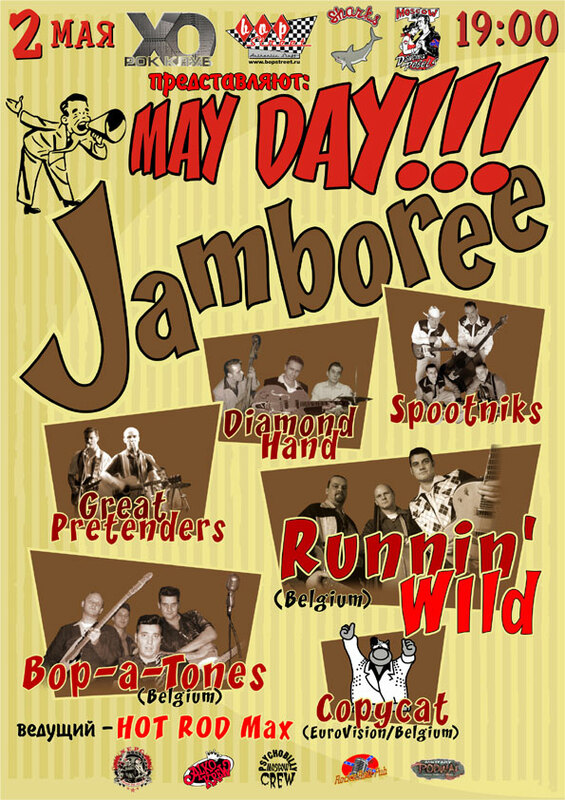 It's a tribute to the Sun label, where the rock'n'roll was born, with Jerry Lee Lewis, Johnny Cash, Carl Perkins, and Elvis all are played by stars of the rockabilly in Belgium and with a 100% original sound. - What are your personal favourites from Elvis’ songs? - All the Sun recordings, I will be happy to make you a acoustic concert in Moscow if you want. - I can but not in the pop business, if we talk about Russian band I tell you right away the Spootnics from st'Petersburg a great country rockabilly band from your great country. - I m so happy to be in Moscow again, I got a lot of friends there specially Lev and his family, also that I wish the Russian visitors will understand the song and the quiet different concept we bring to the Eurosong contest, then I will enjoy vodka for sure with my Russian friends . - Thank you for the interview, good luck with your preparations and see you in Moscow! - Привет, Патрик! Наши поздравления с тем, что ты стал представителем Бельгии на Евровидении 2009! Что ты чувствуешь сейчас, попав на этот конкурс? - Ну, в общем я рад этому, правда приходится много работать, но я и ожидал, что для подготовки к этому конкурсу придется много поработать. - В этом году Бельгийское выступление на конкурсе будет следовать определенной концепции. Расскажи нам, как она создавалась, кто ее придумал, как ты был приглашен принять участие в проекте? - Началось с того, что композитор "Miam Monster Miam" решил написать песню в стиле рок-н-ролл, потом он пригласил Жака Дювалля (известного автора, который много работает с Бельгийскими, Французскими и другими исполнителями) и уже после этого они связались со мной, рассказали мне о концепции, и мы записали демо-версию с лейблом "team4 action" для внутреннего отбора. Дальше вы знаете. Концепция основана на обычном бельгийском сюрреализме и включает в себя мульт-героя, двух бэк-вокалисток в потрясающих платьях и париках, и группу с рокабилли имиджем - контрабас, большую гитару и исполнителя рок-н-ролла. - Как бы вы описали вашу песню "Copycat"? - Хорошая песня, очень запоминающаяся, нечто среднее между поп-музыкой и рок, в которую я добавляю традиционный для рокабилли вокал и немного гитары. Текст - это тоже типичный бельгийский сюрреализм, о том что певец никогда не слышал о том, что кто-то в штатах поет также как он, в таких же костюмах и т.п. - Вы специально работали над костюмами группы, чтобы они повторяли настоящие сценические костюмы группы Элвиса? Вы изучали этот вопрос или консультировались с экспертами? - Ну, прежде всего я - певец рокабилли, и поэтому я постоянно ношу костюмы, сделанные в стиле 50х, поэтому я прекрасно заню, какие костюмы Элвис е его группа носили в это время. Да, и еще мы часто с группой "Runnin' wild" выступаем в Москве, например, 2го мая, мы там будем выступать на большом концерте рокабилли, думаю московские поклонники этого стиля получат большое удовольствие. - Некоторые фанаты Элвиса негативно отозвались о тексте песни, которую вы будете исполнять. Как бы вы ответили им? - Это просто песня, никто не хотел оскорблять Элвиса и конечно же я не хотел сделать это, поскольку я большой поклонник Элвиса. Я думаю, что они просто не поняли подтекста песни, в которой, кстати, имя Элвиса ни разу не упоминается. - Я не знаю, поскольку я новичок в этом конкурсе. Мы уже получили предложения из нескольких стран, выступить на их фанатских вечеринках, но это будет решать телеканал RTBF, основываясь на затратах и целесообразности этих выступлений. Но, в общем, я думаю, что это могло бы помочь проекту, если зрители в каких-то странах смогут услышать песню до конкурса. - Расскажи немного о создании видеоклипа на вашу песню? - У нас была точно сформулированная идея видеоклипа, а то, как я двигаюсь на сцене - это мои обычные сценические движения, костюмы, девочки создают оставшуюся атмосферу, ну и наконец, мы добавили мультипликационного героя - Кота. - Выступление на московской сцене будет похожим на то, что мы видим в видео? Кот присоединится к тебе на сцене? - Да, оно будет весьма похожим, и да, Кот будет либо на сцене, либо на экранах, и все вместе придаст нашему выступлению семейный дух, оно должно понравиться детям, а также привлечь людей, которые никогда не думали о том, что на Евровидении можно увидеть и проголосовать за настоящую рок-н-ролл песню, которую поют настоящие рокеры. - Последние годы нет, но я помню множество хитов со старых конкурсов, Brotherhood of Man, Buck Fizz, Papa Penguin и т.д. и я некоторые песни, как например, Volare, о которых я никогда раньше и не знал, что они были на Евровидении. - Конечно же победить!! ну, если мы выйдем в финал, для Бельгии это будет уже отличный результат. - По немногу от всего, но песня должна быть запоминающейся, чтобы ее жизнь продлилась и после конкурса. - Да, в нем чувствуется влияние политики, но не больше, чем в футболе... мне жаль, что это так, конкурс должен основываться на музыке, и я надеюсь, что в этом году зрители забудут о полтическом аспекте и будут голосовать душей, не задумываясь о политической корректности. - В этом году в конкрс возвращаются жюри, ты поддерживаешь это изменение? - Я слышал почти все песни, мне очень нравится песня Германии (такая джазовая композиция), Турецкая, Английская тоже выделяется. В общем, они все хороши по-своему, я всем им желаю удачи. - Давай вкратце поговорим о твоей карьере. Что ты можешь назвать ее пиком? - Ой, у меня уже такая длинная карьера, я пел с такими певцами, как Азнавур, Нугаро из Франции, с американскими певцами, поэтому таких моментов было множество, ну и участие в конкурсе несомненно будет одним из них. - Ты участвовал уже в каких-то музыкальных конкурсах? Тебе вообще нравится дух состязания? - Не то чтобы очень, я пою просто в своем стиле, который уникален и у которого есть свои корни, начиная от свинга и до раннего рок-н-ролла, это я и буду делать в Москве, просто оставаться самим собой, если людям понравится - очень хорошо, если нет, что же, умирать из-за этого я не буду. - Ты сейчас поешь в группе Runnin' Wild. Как члены группы отреагировали на твое участие в Евровидении и то, что на московской сцене ты выступишь с другими музыкантами? - Со мной выступит наш басист, наш барабанщик тоже поедет в Москву, чтобы поддержать нас и выступать на вечеринках и т.п. Группа очень хорошо отреагировала на это, потому что сейчас к нам и к нашему образу жизни приковано большое внимание. - Copycat, это разовый проект, или вы будете продолжать сотрудничество после Евровидения, не планируете ли вы, например, выпустить трибьют альбом Элвиса? - Это будет зависеть от нашего результата в Москве, если он будет успешным, то мы подумаем и об альбоме. - В твоей карьере уже был случай, когда ты выступал в роли Элвиса, в группе The Million Dollar Sunrise, расскажи об этом? - Да, это проект, который мы собрали уже много лет тому назад, когда я как раз делал обучающие уроки по истории музыки для школы. Это трибьют лейблу The Sun, в котором фактически родился рок-н-ролл, в группе были Джерри Ли Льюис, Джонни Кэш, Карл Перкинс и Элвис, все в исполнении бельгийских звезд рокабилли и все со 100% оригинальными песнями. - Какие твои лично любимые песни из творчества Элвиса? - Все записи The Sun, я буду рад исполнить несколько из них в аккустическом варианте в Москве, если вы меня попросите. - Никого из поп-музыки, но если мы будем говорить о российских группах нашего стиля, то я могу назвать the Spootnics из Петербурга, отличная кантри-рокабилли группа из великой России. - Я буду рал снова выступить в Москве, у меня там есть множество друзей, особенно Лев и его семья, я надеюсь, что все российские читатели этого интервью поймут нашу песню и нашу концепцию, которую мы подготовили для Евровидения, и конечно в Москве мы вместе с вами, друзья, выпьем водки. 2го мая представители Бельгии Copycat выступят на концерте в Московском XO клубе. Нажмите на постер для получения дополнительной информации. On May 2nd representatives of Belgium Copycat will perform on the concert in Moscow XO club. Click on banner to view more info on the venue and event. 18/03 For several days there is ungoing discussion surrounding Belgian entry "Copycat". 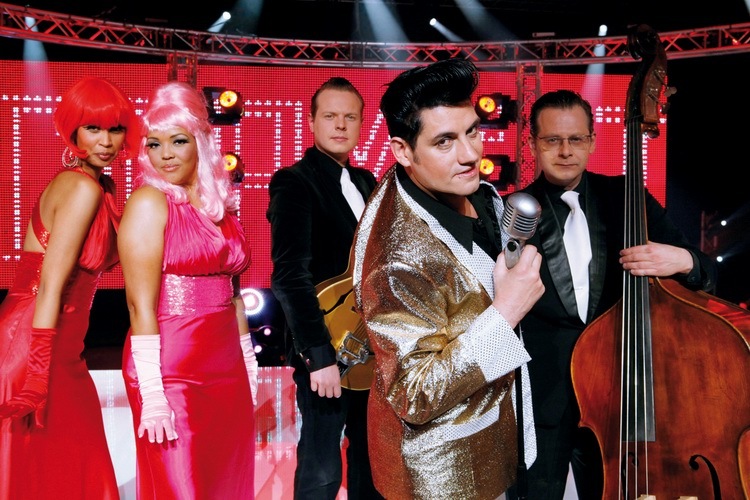 First Belgian "Elvis Matters" club members have complained to EBU that lyrics of Belgian entry are offensive to their idol and the song should not be allowed to take part in the competition. Suddenly, the voice has been aired by American Elvis-songwriter Michael Jarrett, who stated: "I find it really unfortunate that today people are getting fast offended about anything and everything. I think it is a very nice clip. But if this song is disqualified, I will be eager to write another song for Belgium". 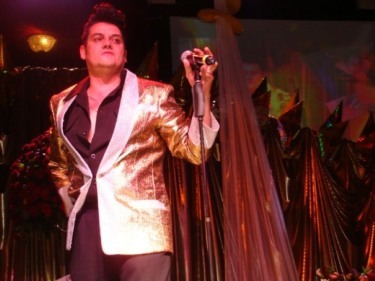 The latest comment has been made by Dutch Elvis expert Ger Rijff, author of 22 books about his idol, who very positively reacted to the video stating: "It is a nice surprise that the singer is dressed exactly like Elvis in 57, with gold jacket and black belt pleat trousers. 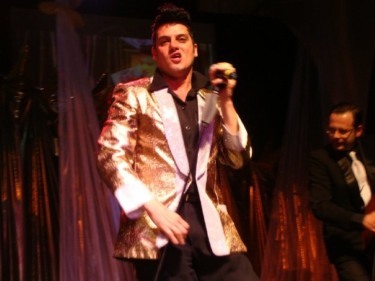 Ouchene is nicely moving his hips and at a distance he looks exactly the young Elvis. It is also a nice detail that the band behind him is dressed as Elvis' musicians at one of his first television appearances". About the controversy surrounding the lyrics he noted: "I do not worry about it. Anyway, 80% of people who will hear the English lyrics will not even understand it's meaning". В течении нескольких последних дней продолжаются обсуждения бельгийской песни "Copycat". Сначала бельгийский фан-клуб Элвиса "Elvis Matters" обратился с официальной жалобой в ЕВС с требованием дисквалифицировать песню, поскольку ее текст весьма негативно отзывается об их кумире. Неожиданно, свое мнение высказал и легендарный автор песен Элвиса, американец Майкл Джарретт, который заявил: "Очень неприятно, что сейчас люди очень быстро обижаются на все подряд. Мне кажется, что это очень симпатичная песня и клип. Но если эту песню дисквалифицируют, я готов написать новую песню для Бельгии". Также, по этому вопросу высказался и голландский эксперт по Элвису Гер Рийфф, автор более 22 книг об американском исполнителе, который весьма позитивно отреагировал на бельгийскую песню: "Для меня стало приятным сюрпризом, то, что певец одет абсолютно также как Элвис в 57 году. Он отлично двигается и издали его вполне можно принять за Элвиса. Также, отлично проработаны детали, музыканты группы одеты также как музыканты Элвиса на одном из первых его телевыступлений". Касательно спорного текста он отреагировал весьма спокойно: "Я не слишком волнуюсь об этом. Все равно, 80% слушателей не поймут смысл англтийского текста". 10/03 Belgian entry, Copycat, performed by Patrick Ouchene, has been revealed today by RTBF. You can watch the video for it on RTBF Eurovision pages. RTBF has also revealed that broadcast of 1st semifinal on 12th of May will be preceeded by documentary "Belgium 12 points: Copycat" at 20.15 local time. Viewers will discover Belgian representatives in their preparation for Moscow; choice of image, choreography, studio recording of their CD, behind the sceens of the shooting of the clip ... Guests of the documentary will be songwriter Jacques Duvall, producers Martin brothers and other famous persons as Sandra Kim, who will show the importance of this competition for Copycat. RTBF commentators for Eurovision will be Jean-Pierre Hautier and Jean-Louis Lahaye. La 1 will broadcast all 3 nights of the contest. Special radio broadcasts have been scheduled as well. From 11th to 15th May: "Backstage" on La Premiere, between 14 and 17h in "Cocktail Curieux". Jean-Pierre Hautier will talk to Copycat in "Bonjour quandmeme" a few days before the contest. 15th of may at 9h15 : "Intermedias" presented by Alain Gerlache, will be devoted to the Eurovision. Jean-Pierre Hautier will report live from Moscow. La Premiere will also broadcast live all three shows. 11th of Match Patrick Ouchene will be guest of Thomas Van Hamme in "A vous de voir" show. On 14th of March from 17h12 to 19h Patrick Ouchene will be answering questions of Regine Dubois and Marc Delire. May 12th from 15h to 17h special broadcast of "Qui dit mieux" with Philippe Jauniaux. Бельгийская песня, Copycat, в исполнении Патрика Оушена, была презентована сегодня бельгийским телеканалом RTBF. Видео на нее вы можете посмотреть на сайте телеканала. RTBF также сообщило, что показ первого полуфинала 12го мая будет предваряться документальным фильмом "Бельгия 12 баллов: Copycat" в 20.15 местного времени. Зрители смогут узнать по-больше о подготовке бельгийских представителей к конкурсу, о их выборе имиджа, постановке номера, студийной записи песни, съемках клипа. Гостями фильма будут Жак Дюваль, автор песни, продюсеры - братья Мартен, и другие известные лица, как например Сандра Ким, которые расскажут о важности этого конкурса для Copycat. Комментаторами шоу на телеканале La 1 будут Жан Поль Готье и Жан Луи Лахе. Телеканал покажет все 3 конкурсных вечера. Запланирована и трансляция ряда специальных радио-шоу. С 11 по 15 мая на радио La Premiere в рамках программы "Coctail Curieux" с 14 по 17 часов будут выходить дневники Евровидения. Незадолго до конкурса, Жан Поль Готье будет интервьюировать Copycat в программе "Bonjour quandmeme". 15го мая в 9.15 "Intermedias" Алена Герлаша будут посвящены Евровидению и будут включать в себя прямое включение Жана Поля Готье из Москвы. La Premiere будет транслировать все три концерта. 11го марта Патрик Оушен станет гостем Томаса Ван Хамме в программе "A vous de voir". 14го марта с 17.12 по 19.00 Патрик Оушен будет отвечать на вопросы Регины Дюбуа и Марка Делире. 12го мая с 15.00 по 17.00 будет транслироваться специальный выпуск программы "Qui dit mieux" с Филиппом Жонио. Philippe Geluck: "I was a little surprised to be asked to associate the Сat with a rock'n roll. However, Jacques Duvall did not have much trouble to convince me of the validity of the approach. It reminded me that since the 30s, the term "Cat" has been "connected" with a world of jazz and rock’n roll. Examples are: The Stray Cats, Les Chats sauvages and Elvis Presley - "The Hillbilly Cat". And, as in his lyrics, he needed a cat "too fat to rock and roll", and I became certain, it is The Cat and nobody else!". Watch 2nd video teaser. Филипп Гелюк: "Я немного был удивлен, когда меня попросили изобразить моего кота в стиле рок-н-ролл. Однако, Жаку Дювалю потребовалось не так много времени, чтобы убедить меня в реальности такого подхода. Он напомнил мне, что с 30х годов термин "Кот" стал прочно ассоциироваться с миром джаза и рок-н-ролла. Примеры этого: The Stray Cats, Les Chats sauvages и The Hillbilly Cat Элвиса Пресли. В тексте, что он мне принес говорилось о коте, который "слишком толст, чтобы танцевать рок-н-ролл" и я понял, что это именно о моем Коте и ни о каком другом. 2й видео-ролик вы можете увидеть здесь. You can watch Patrick Ouchene's interview in VRT show De Rode Loper here or here. 'Whether I go to the Eurovision Song Contest in Moscow to represent Belgium, I will only know on March 10th", said Patrick Ouchene. He claimed he was not yet officially been informed that he or someone else who will represent Belgium in this contest. Интервью с Патриком в шоу De Rode Loper вы можете увидеть здесь или здесь. "Поеду ли я на Евровидение в Москве, я узнаю только 10го марта", говорит в нем Патрик Оушен. Он заявил, что его пока официально не проинформировали, он, или кто либо другой, представит Бельгию на этом конкурсе. 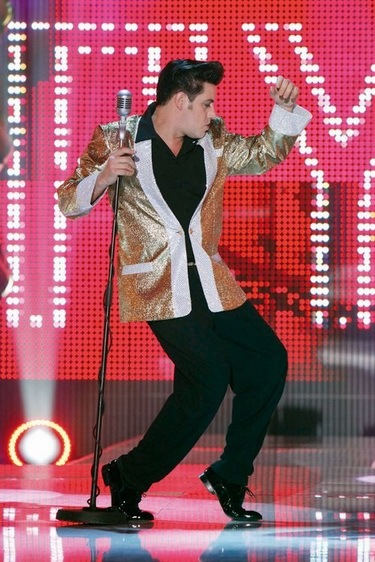 16/02 Today, Le Soir newspaper has revealed identity of the Elvis who will represent Belgium at the Eurovision 2009. 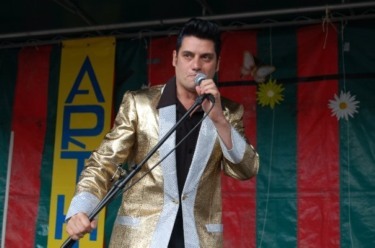 It is Patrick Ouchene, 43 year-old Elvis Presley lookalike from Brussels, member of rockabilly band Runnin' Wild, who also was member in The Domino's scoring minor hit "Je Suis Swing" and The Million Dollar Sunrise - an act featuring Runnin’ Wild’s Koen as Johnny Cash, Mario as Carl Perkins and Patrick Ouchene as Elvis plus Marcel Riesco (Truly Lover Trio) as Roy Orbison. The song author is said to be Jacques Duvall (aka Eric Verwilghen) (worked with Lio, Alain Chamfort, Etienne Daho, Jane Birkin, Marc Lavoine and on the latest release of Runnin' Wild "I Dressed In Black Today"). The theme of the song "Copycat" is a game on this double identity (Elvis and Ouchene). "I'm excited by a new project!!! ", says website of the singer, who has been congratulated on his Eurovision participation by visitors of the site. Site of the band Runnin' Wild hints on some event in Moscow on May 2nd - which likely is departure date for Belgian delegation to Moscow. Сегодня, газета Le Soir раскрыла облик Элвиса, который представит Бельгию на Евровидении 2009. Это - Патрик Оушен, 43-х летний двойник Элвиса Пресли из Брюсселя, участник рокабилли группы Runnin' Wild, который входил ранее в состав группы The Domino's, выпустившей хит "Je Suis Swing" и The Million Dollar Sunrise - группа в которую вошли участники Runnin’ Wild’s Коен в роли Джонни Кэша, Марио в роли Карла Перкинса, Патрик Оушен в роли Элвиса и Марсель Риеско (Truly Lover Trio) в роли Роя Орбисона. "Я очень доволен новым проектом!!! ", говорит сайт исполнителя, которого поздравляют посетители с поездкой на Евровидение. Сайт группы Runnin' Wild говорит о каком-то событии в Москве 2го мая - что вероятно означает дату отбытия делегации Бельгии в Москву. 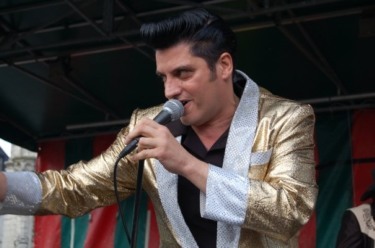 RTBF own site also tips Elvis Junior, the alter ego of 2006 World Champion Elvis Presley Impersonator Franz Goovaerts, with rumoured song title "Copy Cat". Here you can watch RTBF documentary on Elvis Jr. 10 марта, за несколько дней до крайнего срока отборов, установленного ЕВС, Бельгийская телекомпания RTBF представит песню для Евровидения 2009. Ее презентация пройдет во время пресс-конференции в отеле Милано Континенталь в Saint-Josse-ten-Noode, Брюссель. Сам сайт канала RTBF намекает, что эта роль достанется Элвису младшему, победителю конкурса 2006 года на звание лучшего двойника Элвиса Пресли Францу Гуверцу с песней "Copy Cat". Здесь вы можете посмотреть документальный фильм RTBF об Элвисе младшем. 10/02 Elvis for Belgium to Moscow? Promotional campaign for the Belgium Eurovision representative has started today with teasers, sent out to the press by the person named "Elvis" and stating that "Rock'n'Roll legend will reprsent Belgium at the Eurovision 2009", uploaded to Youtube by "Leopold The Cat", character for the Russian cartoon. It is known, that Belgian act for the contest has been chosen a while ago, in autumn, though it's presentation will take place only in early March. Fans suggestions for the candidate now includes Belgian Elvis impersonator Elvis Jr. aka Franz Goovaertz, real Belgian rock-n-roll legend Arno Hintjens, Erik Goosens, singer of Leopold III band, who have tried out for Eurovision 1993 and Alec Mansion, singer for Leopold Nord & Vous, author of Belgian 1987 entry. It should also be remembered that RTBF broadcaster represents Wallonia, French speaking part of Belgium. Элвис представит Бельгию в Москве? Промо-кампания в поддержку представителя Бельгии на Евровидении началась сегодня с рассылки прессе неким "Элвисом" видео, гласящего, что "Легенда рок-н-ролла" представит Бельгию на Евровидении 2009", выложенному на Youtube неким "Котом Леопольдом", героем известного мультфильма. Известно, что исполнитель, который представит Бельгию на конкурсе, был выбран уже достаточно давно, еще осенью, но его презентация пройдет только в начале марта. Фанаты уже сделали несколько предложений по поводу того, кто может скрываться за этим: это известный бельгийский двойник Элвиса Элвис младший или Франц Гуверц, настоящая бельгийская легенда рок-н-ролла Арно Хинтьенс, Эрик Гусенс, солист группы Leopold III, которая пробовалась еще на Евровидение 1993 и Алек Мансион, певец Leopold Nord & Vous, автор Бельгийской песни на Евровидении 1987. При этом надо также учитывать, что телеканал RTBF представляет Валлонию, франко-язычную часть Бельгии.